If you were impressed by the offerings of Oppo Find 7 smartphone which was just recently announced, you might also want to take a look at this ZTE Nubia X6. This phablet is not just big in size but also in its technical specifications both inside and outside of the device. One of the highlights of Nubia X6 is its cameras which sport 13MP both front and back sides of the device. It's a massive device sporting a 6.44-inch display which features Full HD OGS (Continuous Grain Silicon) IPD screen. Also that 1920x1080 resolution front panel is covered with Corning Gorilla Glass. Its innards are also impressive which the processor is powered by Qualcomm's newest chip called the Snapdragon 801 a dual-core processor clocked at 2.5GHz with 2GB RAM. The storage options for the Nubia X6 will come in three selections and those are in 32GB, 64GB and in 128GB. Unfortunately all these variants do not support microSD card for additional space, so if I were to buy this one I would make sure to buy the biggest one. Also the 128GB features 3GB of RAM. Now going back to the cameras, again that is 13MP for both front and back cameras. The rear one will have Optical Image Stabilization technology or OIS, f/2 aperture, LED flash and Full HD recording capability. Connectivity wise, there are 4G LTE, 3g HSPA+, Bluetooth 4.0, WiFi 802.11 b/g/n and many more. 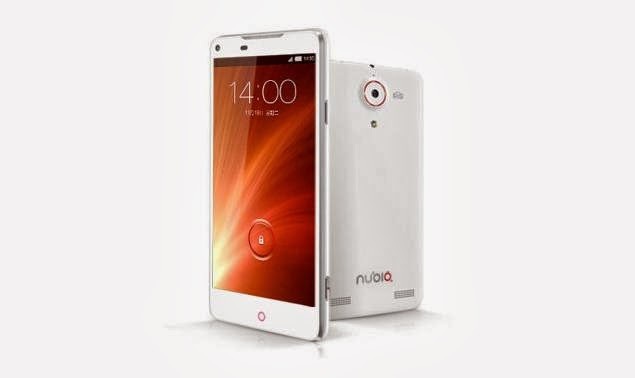 The ZTE Nubia X6 is 7.9mm phablet powered by a 4250mAh battery and only weights 215grams. It is currently announced and released in China and as of yet there is no word if the device will have its international release.